The decrease in light emitted over Nepal following the April 25 earthquake. Warm colors (red and green) show the largest drop in light emissions, and cool colors (blue and green) show a smaller drop in light emissions. Space agencies around the world are using satellite images and other technologies to aid rescue efforts and learn more about the April 25 earthquake in Nepal, which killed at least 5,000 people; injured 8,000; and affected millions. For example, the European Space Agency (ESA) is using radar images to map the ground movement before and after the Nepal earthquake, and NASA is compiling similar images to determine any risks that may still be present and to better assess the existing damage. Less than a day after the earthquake struck, ESA's Sentinel-1A satellite orbited over Nepal, capturing radar images. Scientists combined these new images with images taken before the earthquake, to create rainbow-colored interference maps, which show the differences — specifically, land movement — between the two images. The maps confirm that an area as large as 6,000 square kilometers (roughly 2,300 square miles) around Kathmandu lifted up by at least 1 meter (about 3 feet). This map tells scientists which parts of the fault slipped and which parts did not. Those that didn't slip are primed for a future earthquake, according to ESA officials said. Sentinel-1A will continue to take images of the same patch of land every 12 days, allowing it to be monitored regularly. Similar images at NASA allow scientists to track hard-to-reach remote areas and those at risk for landslides, river damming, floods and avalanches. 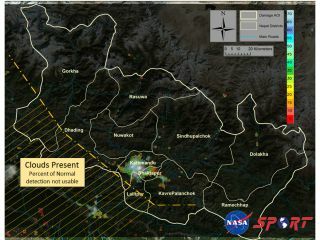 NASA scientists have also used before-and-after satellite images to map decreases in light emitted over Kathmandu. The warm colors (red and yellow) indicate the largest reduced light emissions, and can be seen around Kathmandu's epicenter in neighboring towns and suburban areas. These images will help relief operations determine which areas have been most affected by electrical outages. NASA scientists hope to get this crucial satellite data to government officials in Nepal, where Internet bandwidth is limited, according to a statement from NASA. Additionally, NASA is deploying technology that can help locate people trapped beneath the rubble in Nepal. This technology, known as FINDER (for Finding Individuals for Disaster and Emergency Response), sends a low-powered microwave signal to search for small movements made by a person's breathing or heartbeat. It can locate people hidden underneath 20 feet (6 m) of solid concrete and from a distance of 100 feet (30.5 m) in open space. NASA says this technology can help emergency responders locate victims before moving the rubble to rescue them.